BIG CARD pages added…but not quite done. Sorry email followers. I don’t mean to SPAM you, but as I am testing things about post formats it will send you new ones. Just ignore them. I promise it won’t be too many more. After a few days of no power issues, of COURSE, just as I was allowing myself to relax, the circuit blew last night after dinner. “Magic Hour” indeed. Annoying, but more so when I brought back my Mac in that my internet connection was rubbish, and it just kept dropping thru the morning. No support till Monday, and DH is pretty convinced they only need to reset the dslam at the exchange (which they have done before) to solve the problem for NOW. But if the power keeps blowing, the exchange is going to keep thinking the connection is unstable and keep dropping the sped lower and lower every time. Right now I am on DDs connection, the old Talk Talk one rather than my Spitfire one son everything is SLOWER. New theme again – The fonts in the side bar of TwentyEleven bugged me. This one is called Yoko, and I like it a bit better, except I thought it had a 2-column option. It does for the menu pages at the top, but thew body is 3 column only. Bah! I am working on the BIG CARD pages. I am loving the Gallery option for showing the images in a mosaic, but I wish it were possible to make the images a link, or add a link when they display, so if you want to read the full post you can. I have to check and see if there is some way to make the caption a link. Until then, I will have to add all the clicks as text. But this is what you see on the pages for each suit. I had forgotten some of the techniques I used, but I am sure I will revisit them soon. I love how some of these look, if I do say so myself! 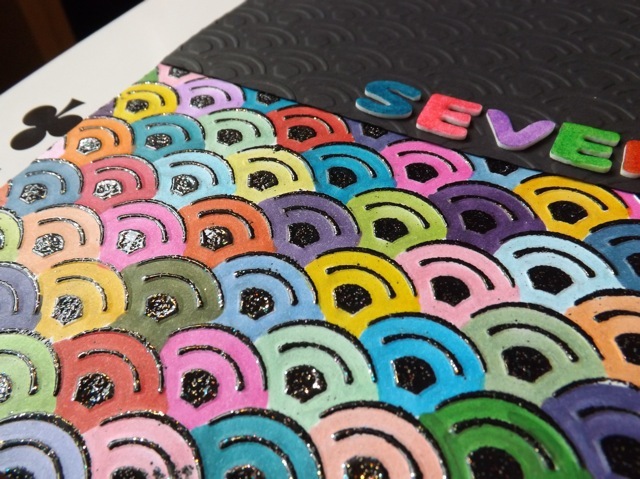 I did manage to follow thru with my final BIG CARD, my year-long project using approx. 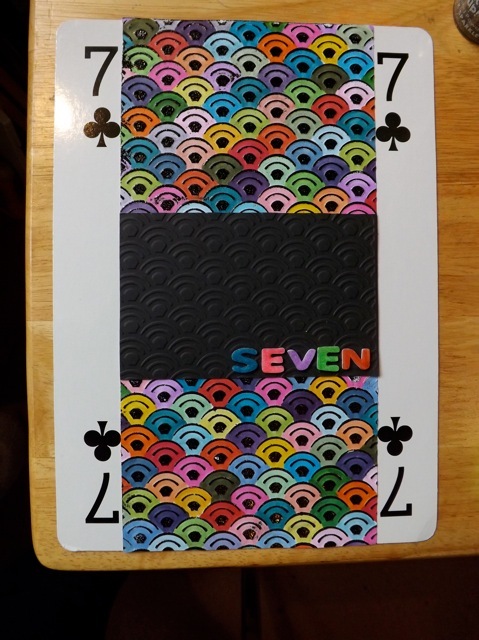 A4 size cards from a deck I got at Tiger. I’ve not found a 2nd deck there, and had used one or two of them for other projects before I began so I do have a handful that are missing. Not a big deal for me, as the goal of the project was to use them to try various techniques. 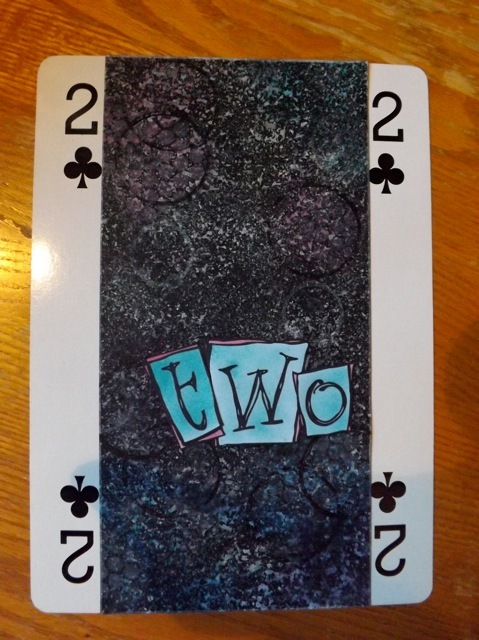 I had the idea to scan them and send them to one of those places that turn your art into a real, normal sized deck of cards but in the end, unless I manage to find another one, that won’t happen. Still, the process was an interesting one. Some of the techniques were ones I came up with, some were ones I read or saw someplace and some began with one idea and I expanded on it. It’s been so much fun and such a learning experience. I feel I have really tested my supplies and discovered a lot along the way. The lacy edging was, if I recall, designed from a dingbat and cut on my old CraftRobo. I thought the crayon would be more vibrant on black, but the colour is actually quite sheer and the effect not as bold as I wanted. I based that on another layout from the article, where I drew a swirl with a template, coloured it in with crayon, then buffed the waxy crayon to a shine. 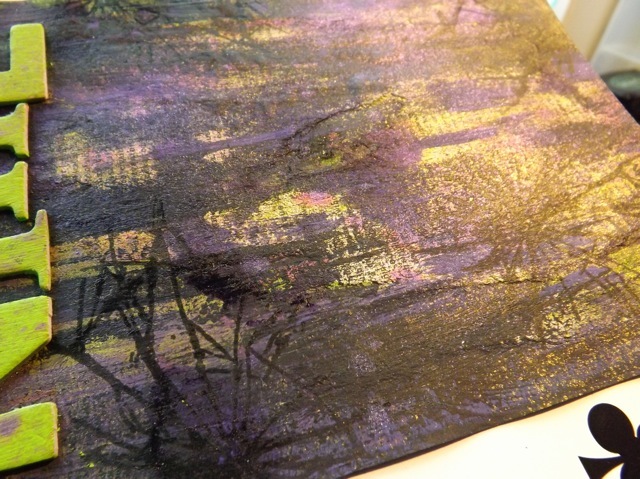 As you can see from the small layout (the only photo I have of it on hand) the colour is bright and bold on the black. I hoped it would be so by shaving and melting. I just shaved the tips with a craft knife. Poor misused crayons! 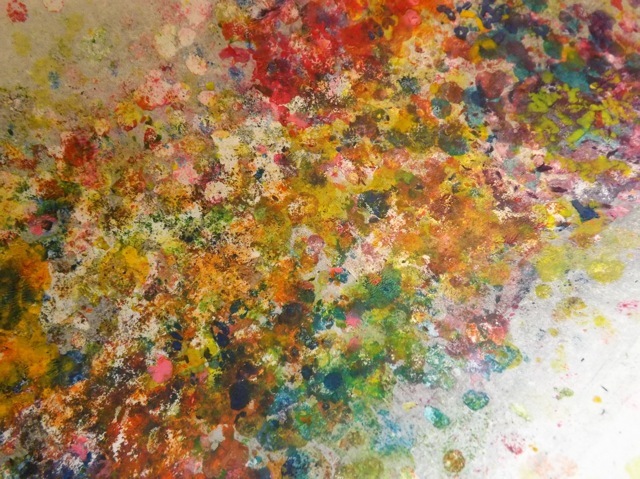 I think for the original I laid a bit of acetate over the crayon, melting it onto the cardstock, then rotating the acetate and melting the crayon still on it onto the cardstock as well. For this I used a bit of freezer paper. It was interesting, I liked it, but not over the moon with it. 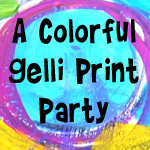 But checkout the freezer paper! Jiminy! I liked that A LOT. Some off things happened. 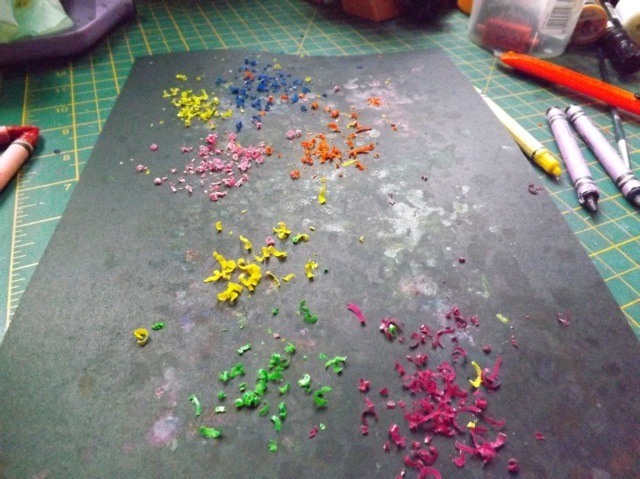 First, the plasticy coating on the freezer paper melted away, leaving it more like paper and less …plastic. 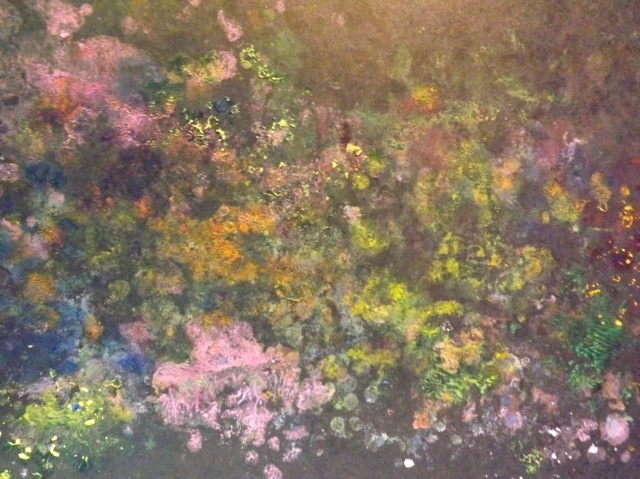 Next, some places the crayon lifted away, down to the white paper, so further melting left some bright patches. 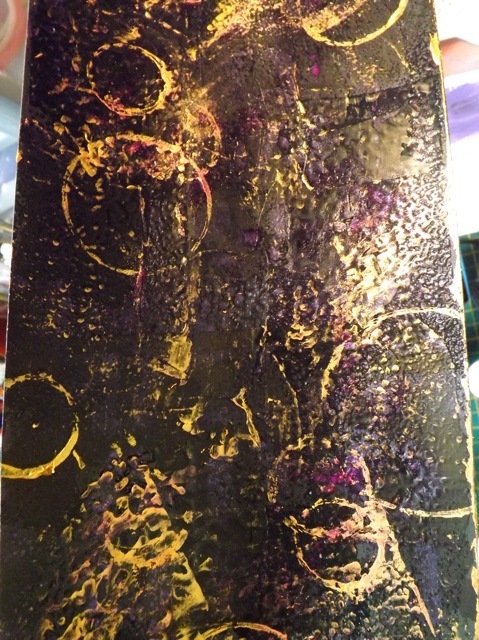 It’s very layered and with real depth. So, faced with two choices, which would you choose? The more I look at the black one, the more I like it for its subtle warmth, but in the end…. 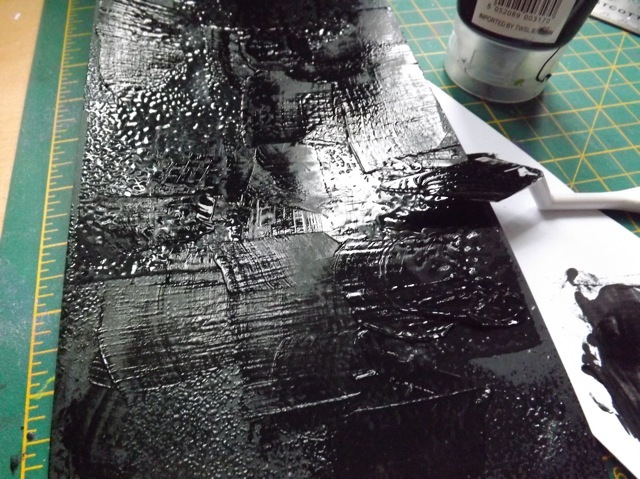 I did smudge on some Black Soot DI, which actually worked better than I thought with the sheen off the freezer paper. I wonder how it might work on canvas? I bet it would be very cool. 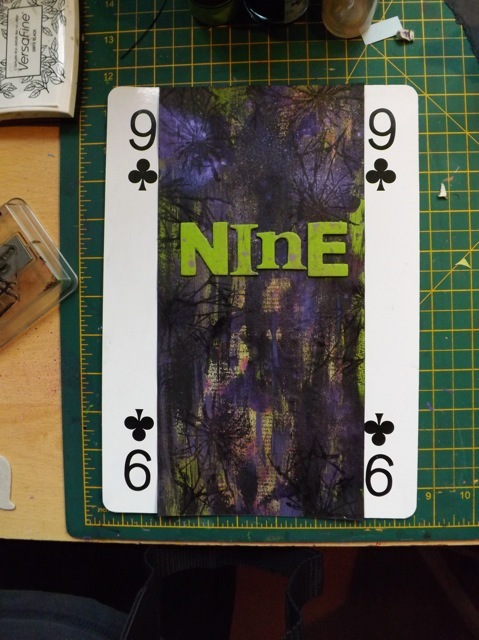 So, I still want to wrap up my BIG CARDS and review what were some of my fave techniques, and go back to make sure I’ve tagged them all so if you click BIG CARDS you can see them all, but that will have to wait for another day. If you have followed this over the last year, I hope you had fun with it and got some ideas for how to push your art supplies to the limit. I think I did well in sharing the disasters, or where something went wrong, but don’t I always say I mess up so you don’t have to? Bet you had given up on me for today. I have been properly working, sorting out the last bits of UKS sponsorship and the Holiday Home page stuff and it took me till dark to finish. Hence the not excellent photos. But I actually think the dim light may enhance this one. You tell me. 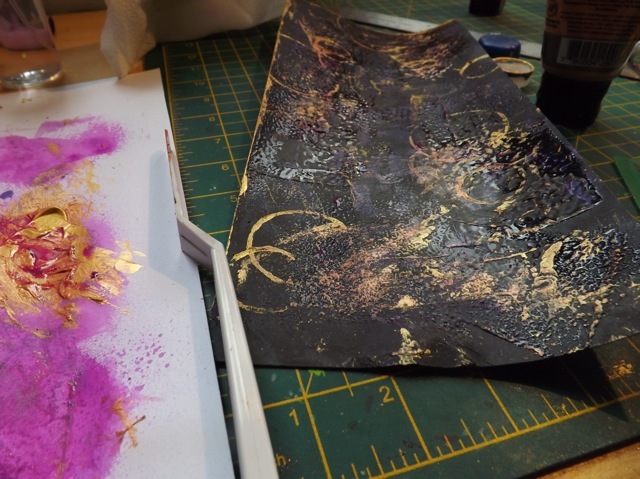 I got one of the IndigoBlu glue & gilding flake kits and was dying to play with it. They have a blog too! I’ll bet you expected Pan Pastels … Maybe next week. 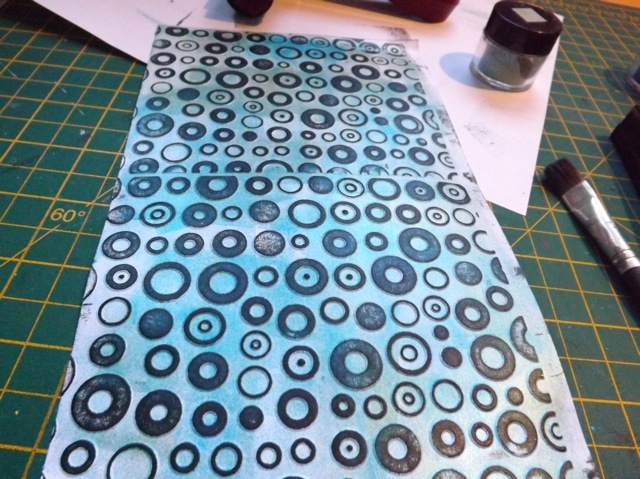 As soon as I saw these I knew they would surely work with the brayer-on technique. Sure enough, they did. 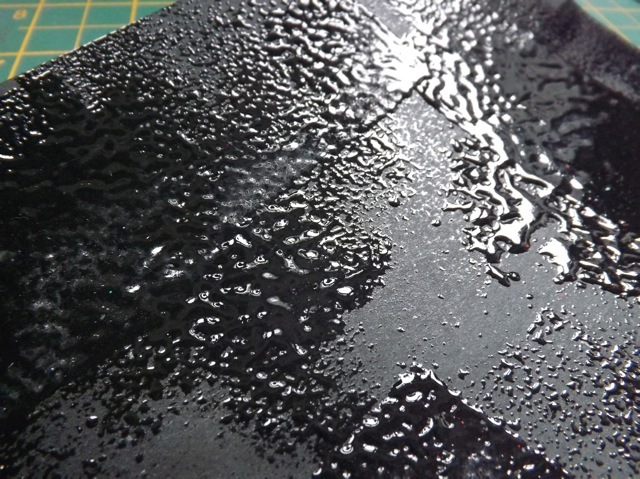 I embossed the top and bottom of my black card then put a pretty small dollop (no more than the 1/2 teaspoon suggested when loading the fat foam to make a stamp pad in the leaflet) of the glue on a ripped page protector. 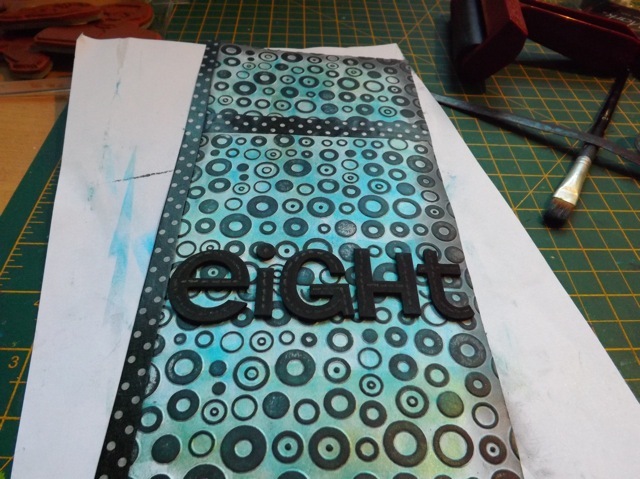 I rolled over it with the brayer, over and over, to ensure a thin coat, then ran the brayer over the embossing. I rubbed on the flakes, and let it sit for a while. 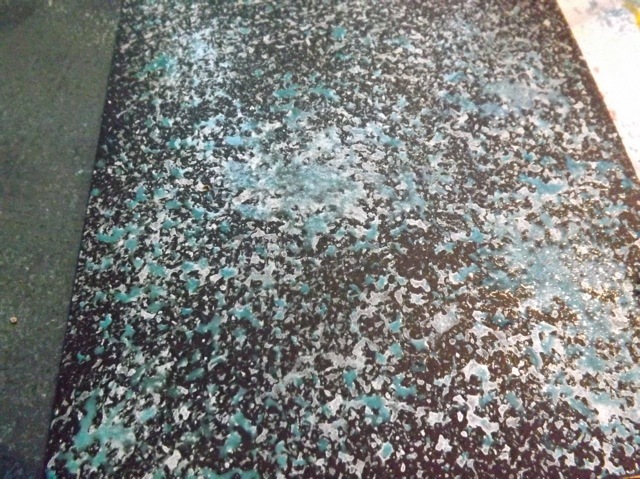 On my practice piece I felt the scrubber dulled the shine of the flakes too much if the glue was too damp. 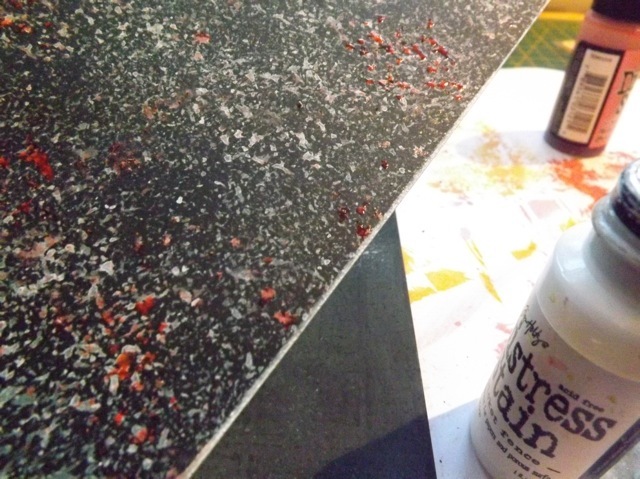 I added an area of Pearl-ex in what should have been, from the look of it, a pretty good match to the reddish flakes (and I was using Brighton Pier) but was a bit more to the pink side than I wanted. It still works, I think. 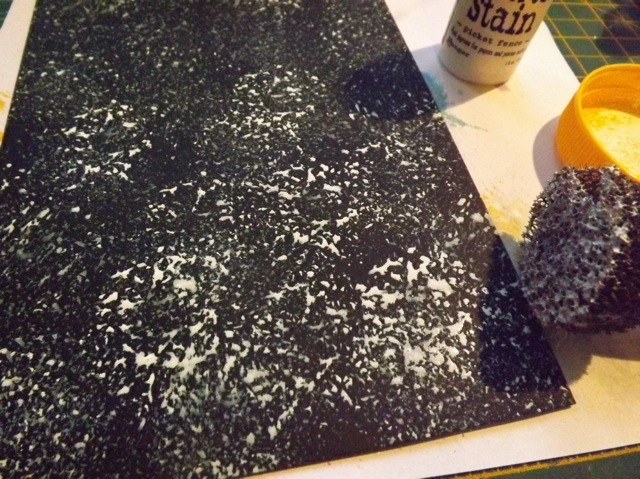 Then I stamped over that and embossed with black. You can sort of see it at the top here. 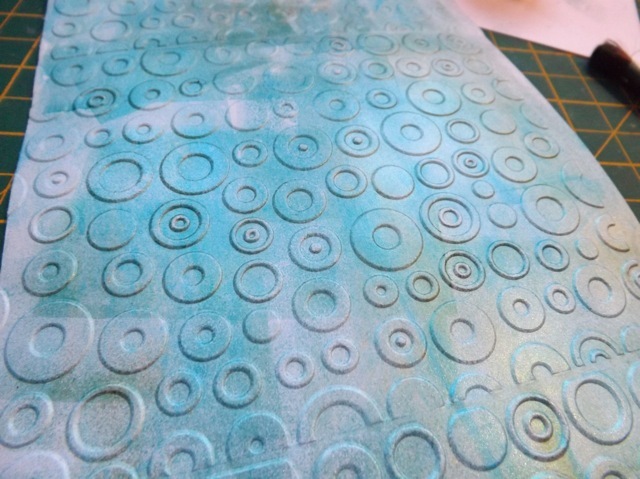 Technically I suspect I used the “wrong” side of the embossing folder, but this side left the open area st the bottom, the “right” side it was all raised so would have been covered with the glue and then the flakes. I prefer it this way. It really GLOWS. 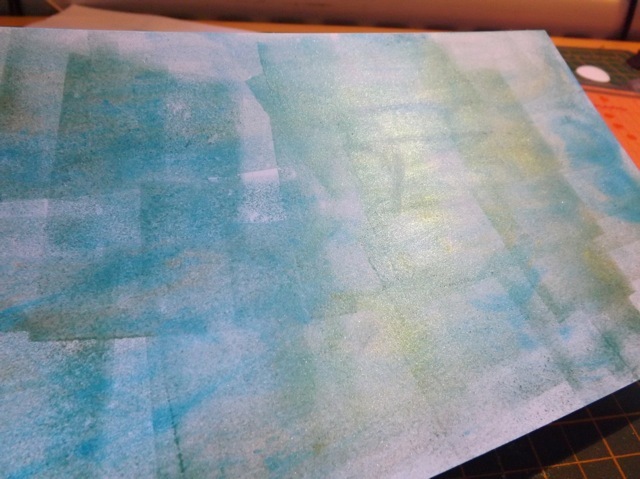 And yes, the brayer cleans up perfectly with soapy water. 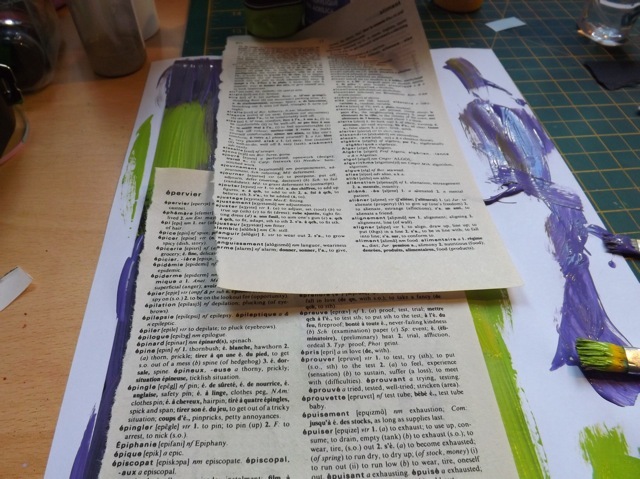 The glue stays moveable for a bit, but if it dries too much it totally tears the paper when you try to roll the brayer. 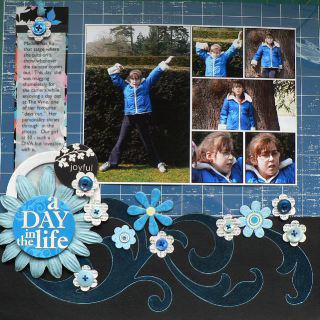 Practice on a scrap! This will be lovely with the snowflake embossing folder and the Winter …whatever it’s called, the silver flakes that comes with the kit. It’s on the floor someplace…. OK so this is a weird one. It occurred to me that so much of what I do is on my computer, not at all sticky, inky, scrappy or messy, and that fact is not reflected at ALL in my BIG CARDS. 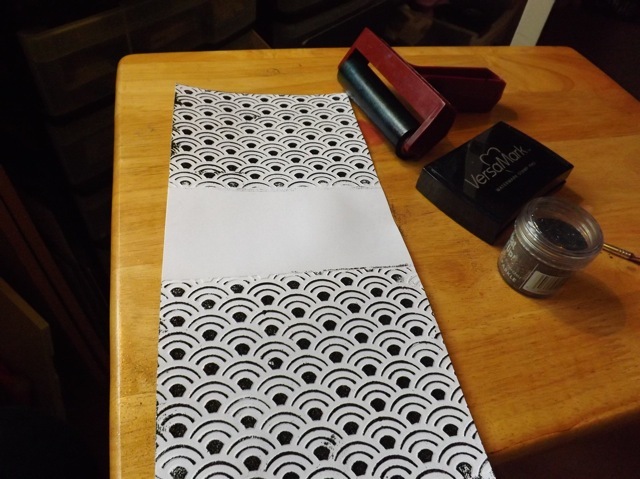 I had the idea to stamp all over the sheet, with some of the 100s of letter and number stamps I have, for one of my BIG CARDS, and it kinda hit me that the same thing would work well, better, maybe, with fonts. So that’s pretty much it. Here’s the card – I simply created the file in my drawing program and the only thing I did was Copic colour the pointing finger dingbat. 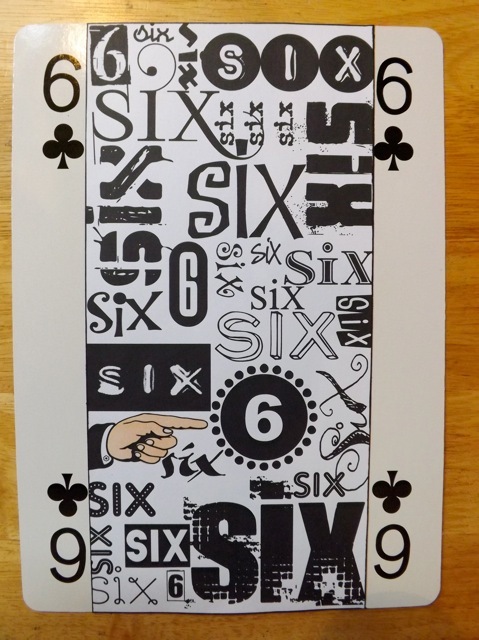 I actually considered printing it on coloured card or paper, but I really wanted to colour the hand so left it on white – interesting, isn’t it, that the white of the card is so…NOT. 5 to go! I freely admit I NEVER thought I would manage to follow-thru on this. With only a couple of weeks missed out for previously used cards, and a couple of not-Monday posts, I am now so close to the end. I really have enjoyed challenging myself, had a great time playing with techniques and supplies, and need to come up with something for next year that will keep me experimenting! But for today, it’s my birthday and I am having a lazy day, so not going to worry about THAT just yet….. 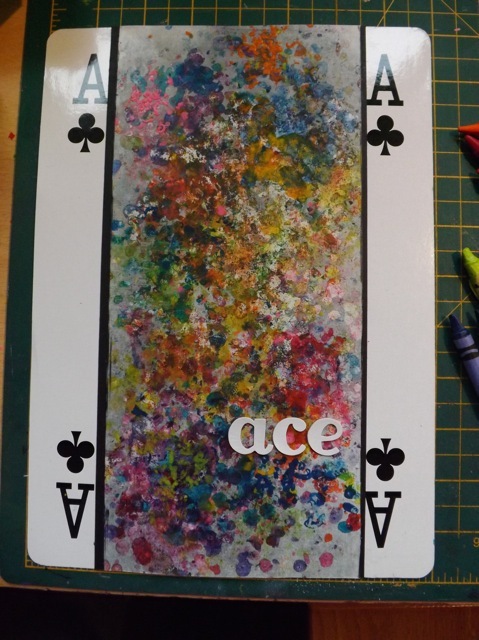 Categories: art, BIG CARDS | Tags: big cards, technology & scrapping | Permalink. I had a lot of ideas for this one but I was feeling pretty crap due to a nasty cold so went with something easy. 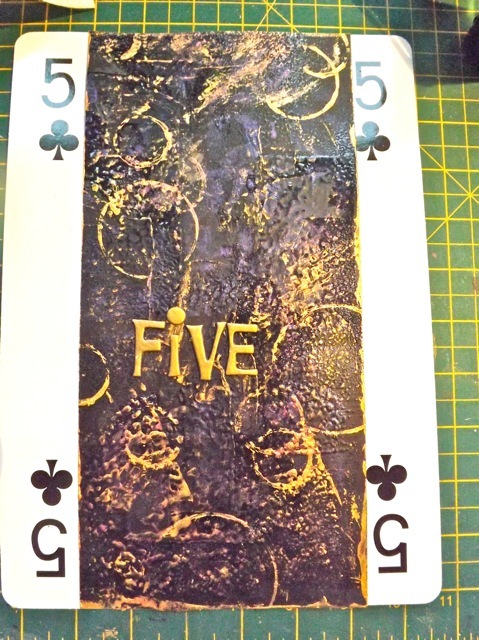 I simply embossed the background card, then brayered over some embossing ink and het embossed with some sparkly black embossing powder. I left the middle empty for the letters. 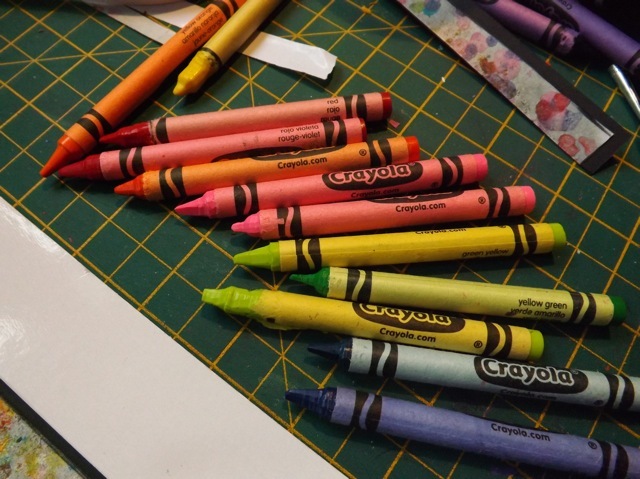 I used my Copics to colour the arcs – very bright, very random. The letters are little foam ones, which I also coloured with the Copics to match. Probably one of the brightest of the lot. 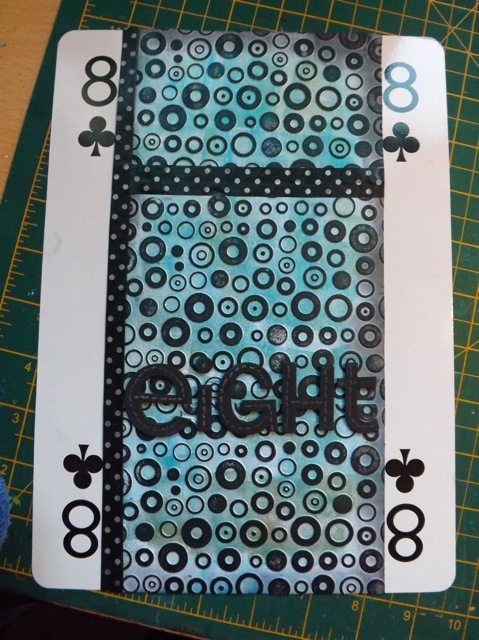 I think had I been more mentally on the ball, I would have done two things – first, I would have matched up the embossing on the black card and second, I would have brayered on the embossing ink over the black card as well, and added the sparkly black embossing powder to it too. I may still be able to add that but not today. Categories: art, BIG CARDS, Copic colouring | Tags: art techniques, big cards | Permalink. 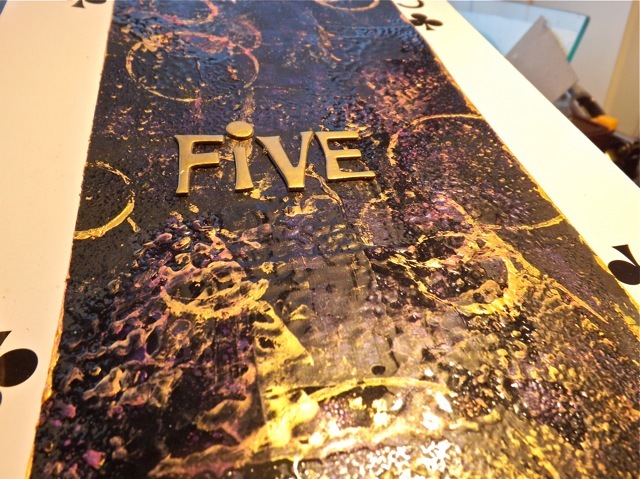 I had the idea of using Pearl-ex on the base card then embossing it with a folder and then doing my brayer-over technique. So that is pretty much exactly what I did. 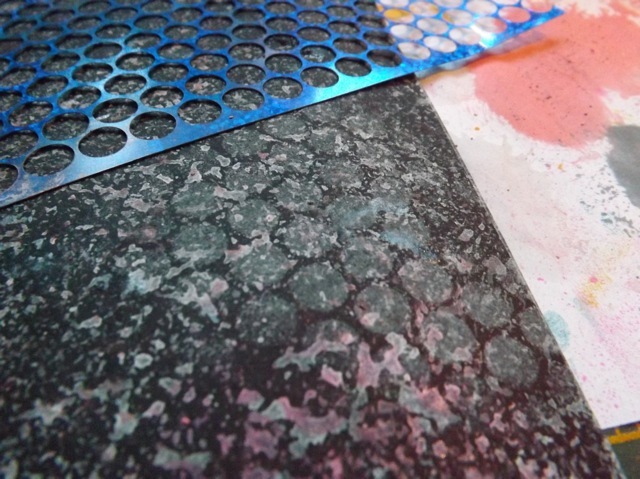 I daubed the entire base piece with Versamark – I wasn’t aiming for total coverage, I wanted some interest and variation. 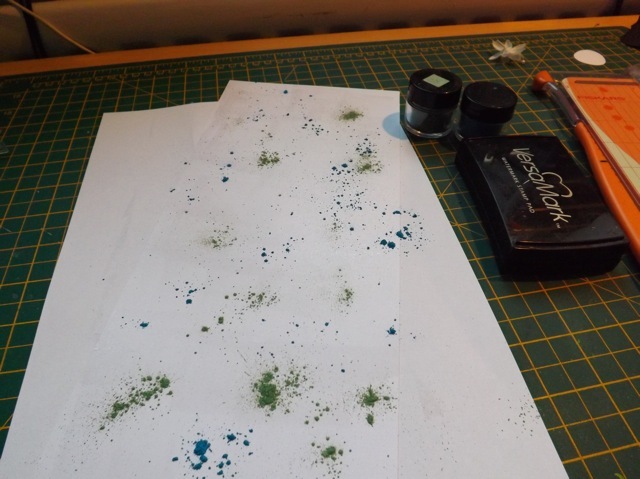 I dropped on blobs of sea green and turquoise Pear-ex and brushed it over. 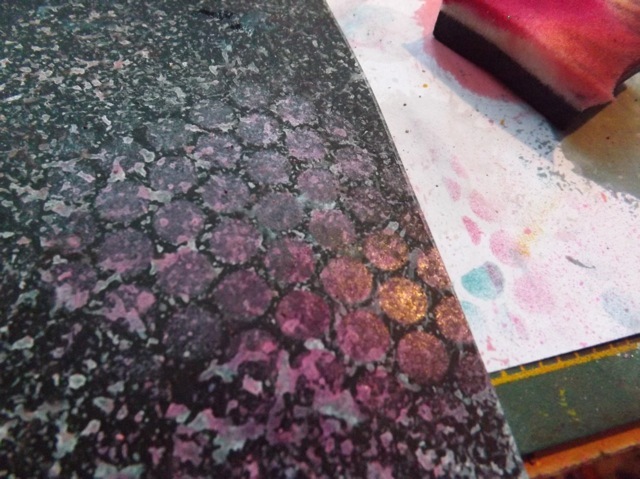 I embossed the whole sheet – annoyingly it was wider than the folder so I did it sideways in three steps. No matter how I tried it still left the edges very clearly on show. I brayered over Versafine, which is nice and BLACK, and love the look. Added some Washi tape across to hide the folder edge and one side as well, just so it didn’t look like a random strip. Why am I loving washi tape at the moment? I must take a better photo of the taped monitor in the sunshine – it really does look amazing, if I do say so myself, but the sun is already in the wrong place for the kitchen (which is loaded with laundry, as I play catch-up after almost 2 weeks without a dryer) so maybe tomorrow. As a nod t Halloween, I wanted the card this week to be a little spooky. 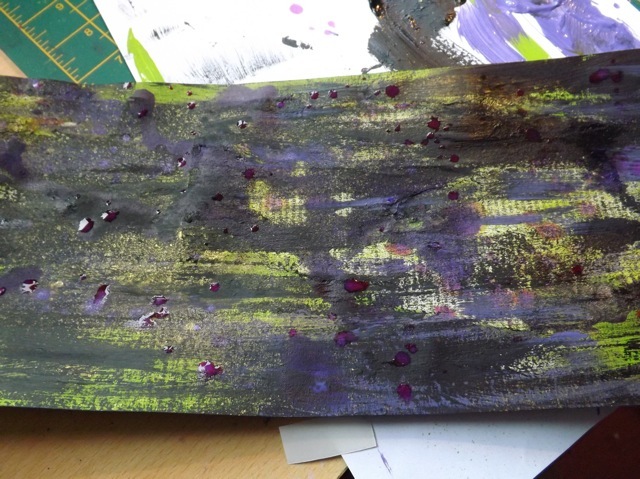 I painted the black cardstock base with purple and lime green paint then laid over some book pages while it was wet. 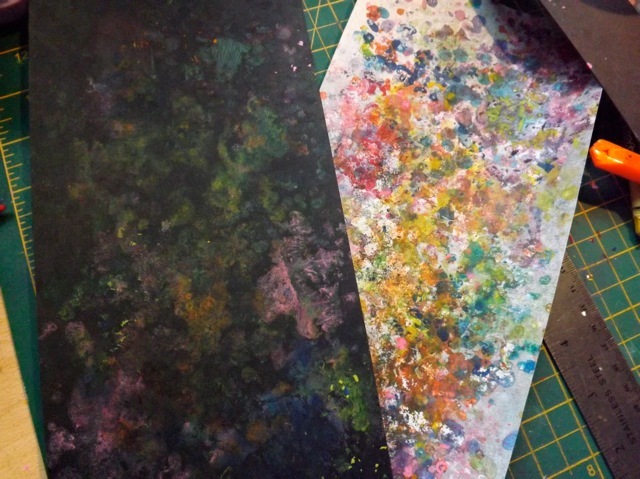 After it dried, a bit but not totally, I peeled them away, leaving some bits of paper behind. 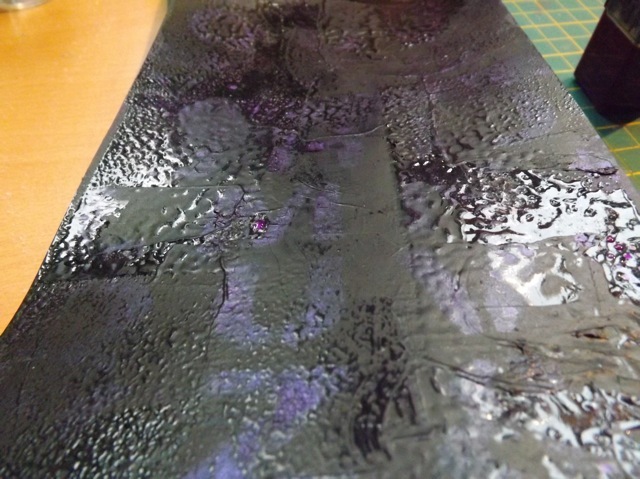 After that, I dry brushed a bit more paint over the pages, sprayed some Cosmic Shimmer in green and purple, dripped on some purple ink, and just layered and layered until I liked what I saw, I didn’t have a plan, I was just playing! 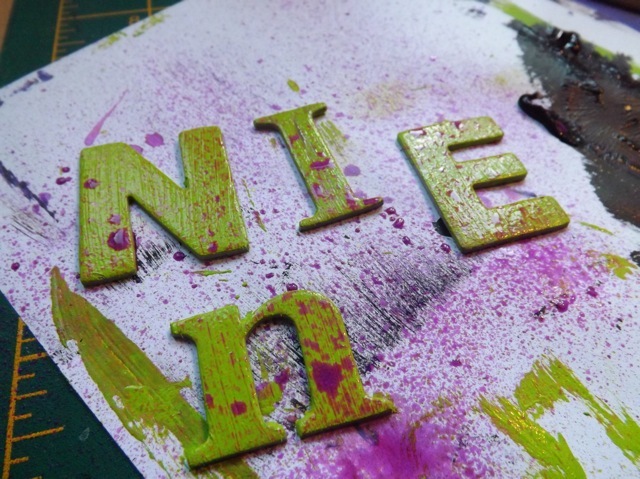 Then I painted my letters lime and spritzed over a blast of the purple Cosmic Shimmer mist. Over it all I stamped the cracked glass stamp (from Visible image) and that finished it off nicely – it’s not quite a spider web but gives a similar feel. It looks a bit drippy and mouldy and suitably spooky.